In February 1887 the Methodist Book Concern and the Missionary Society began considering leaving the building they had owned and occupied for nearly 20 years at Broadway and 11th Street. A new facility, it was argued, could combine the offices with the printing and binding departments of the Book Concern which had been housed on Mulberry Street for 40 years. At the time the Methodist Book Concern was, by some reports, the largest publishing firm in the world. By November a committee had selected the southwest corner of 5th Avenue and 20th Street and purchased the land for about $65,000. The location was ideal, for by this time the strip of 5th Avenue from 13th Street to 23rd Street was already being lined with religious-based office buildings – printing and publishing houses, missionary offices and church headquarters – earning it the nickname Paternoster Row. Edward Hale Kendall, who had designed the Gorham Building on Broadway and 19th Street four years earlier, received the commission to design the building and on Mar 23, 1888 the cornerstone, containing issues of all the religious weekly publications, was laid. Kendall produced a robust Romanesque Revival structure that was completed two years later. Two floors of rusticated pink granite formed a base for four stories of red brick. A trio of three-story bay windows nestled in long four-story brick arches on the 5th Avenue front gave movement to the façade. Above the top floor a classic balustrade with stone urns encircled the roof. The Methodist Book Concern printed periodicals like The Christian Advocate (“Official Newspaper of the Church”) and the Sunday School Journal. Yet despite the virtuous publications that were produced here, the Concern was not immune to scandal. In 1896 Methodists were shocked by the publication in Baltimore of the Rev. Dr. John Lanahan's book "The Era of Frauds of the Methodist Book Concern at New York" in which he made accusations of "great corruption and fraud, involving losses of several hundred thousand dollars." Scriptures and believe that mistakes of grammer in the King James version are inspired, and that Jonah was literally swallowed by the whale." 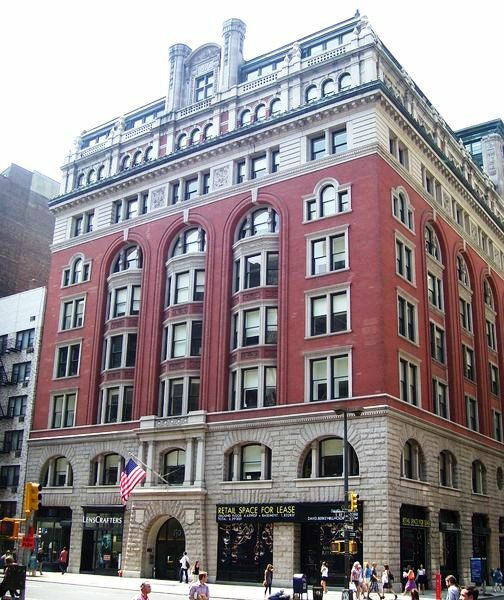 Three additional floors were added in 1909, including medeival-style ornamentation and the decorative monogram MBC on the Fifth Avenue facade. The building continued to house printing firms throughout the first half of the 20th Century. In 1951 Abingdon-Cokesbury Press was headquartered here when it published the first of twelve volumes of “The Interpreter’s Bible,” the first multi-volume Bible commentary printed in 130 years. Although the Methodist Book Concern moved to Nashville in 1939, a wholesale office and bookstore remained until 1962. By the second half of the century, however, the neighborhood and the building was changing. The Amalgamated Laundry Workers Health Center was here in 1953 and by 1960 it housed the headquarters of Ideax Corporation, a camera and photography equipment distributor. Thirteen years later, on December 4, 1973 a bomb exploded in the offices of the United States Committee for Justice for Latin American Political Prisoners, injuring two staff workers. Unsympathetic street level renovations caused The AIA Guide to New York City to complain that "the ground floor entrance has been modernized with misunderstanding." However in 2001 new owners L& L Acquisitions commissioned architects HLW International to do a $6 million restoration and renovation. The facade and entrance were restored (the granite had been painted gray and the arched entrance had been boxed over), and the lobby was redesigned with a vaulted ceiling and stone floors. The building was purchased only a year later by a German institutional fund for more than $102 million. Today No. 105 Fifth Avenue has regained the dignity of its street level and is a stately reminder of the long-gone Paternaster Row. Cool, I work on the 9th Floor currently. I'm reaching out today to track down archives of publications from the late 1800's. The reason for my search and my reach out to you, is my great great grandmother during the mid to late 1800's created wood engravings which was the medium for making and printing art illustrations at that time for Randolph's The Methodists Book Concern publishing house. My ancestor was one of the first women graduates from Cooper Union Art School in NYC (1864), and was best known for her wood engravings commonly used for illustrating both books and newspapers in those days. I have old 1909 NY Times articles talking about an image of “Jefferson Davis Being Captured she created,” and in the same 1909 article it mentions specifically about her work with Randolph's. Due to this I was hoping you may be able to give me a hand tracking down some of her works or at least point me in the right direction. The end game for my great great grandmothers works is as a birthday gift for my dad, he also became an artist and these items would make for the perfect birthday gift at his 90th. birthday party this summer. If you're able to help me track down anything showing art illustrations by my ancestor Bianca Bondi (married name Bianca B. Robitscher) please contact me immediately. Thanking you in advance.